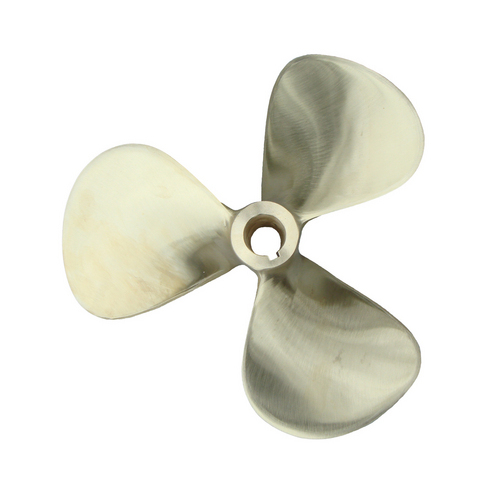 Freeman Cruiser propellers are availble to fit the majority of standard Freeman propeller shafts. For more details and information on ordering either telephone or come and visit us. New propellers are usually available to fit the majority of standard Freeman propeller shafts that need replacing with several held in stock. If you think you need to repair or install a new propeller please contact us on 01491 652085. It is generally a good idea to look at the propeller when the boat is out of the water, small chips and nicks can easily be filled and cleaned as a repair, anything worse than this then the propeller should be removed and sent to us for refurbishing and re-balancing. If you can send or bring the propeller to us we can check the condition and repair if it is viable to do so. If there appears to be more serious damage, particularly at the boss (the centre point where the blades meet), or electrolysis has set in then a new propeller is usually the only option. Look for signs of 'pinkness' and tap the propeller blade to see if it has an unfortunate 'dull thud' or a healthy 'ring'. Many underwater components are covered by marine insurance so it is a wise idea to check your policy details to see if you are covered for accidental damage. Please note: When checking and working on the underwater gear it is important to disable the engine so that there is absolutely no chance of it starting while you work on the gear.